"Listen to them: children of the night. What music they make!" If Bela Lugosi’s presence in Tod Browning’s Dracula established the actor’s legend, then his absence in Universal’s Spanish-language production immediately reconfirmed it. In almost every respect, George Melford’s take—which was shot in conjunction with its more famous contemporary—represents a filmmaking improvement over Browning’s effort. Yet, the shadow of Lugosi hovers over it and singlehandedly casts doubt upon any debate that pits the two against each other—not that films merely exist to battle in critical deathmatches, mind you, but this is an especially fascinating situation that practically invites comparison. This particular bout results in a draw, but one can certainly make the argument that Melford’s version is a Lugosi performance away from being a truly towering achievement of early horror. Shot at night when the English-language film had shut down production for the day, Melford’s film essentially utilizes the same script but retains more of the material. 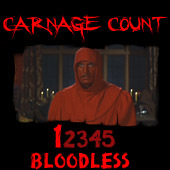 Clocking in nearly 30 minutes longer, this alternate take has more room to breathe and just feels spookier from the outset, which finds solicitor Renfield (Pablo Alvarez Rubio) summoned to Dracula’s (Carlos Villarias) castle on Walpurgis Night, much to the dismay of the aghast locals. Upon arrival, he’s promptly seduced by the Count and his trio of wives, who transform him into one of the undead before embarking upon a journey westward in Dracula’s vaguely nefarious scheme to spread his corruption of the innocent. His ambitions are limited to preying on a local family, particularly Lucia (Carmen Guerrero) and Eva (Lupita Tovar), a pair of beauties who instantly find themselves in Dracula’s gaze. Said gaze isn’t as powerful or hypnotic as Lugosi’s, but Melford’s film is an otherwise mesmerizing experience, one that leaps off the screen with more potency than the Browning film. Whereas the latter is often a hemmed-up, stagebound production with an air of stuffiness that even Lugosi struggles to break through, Melford’s is a more stylish, cinematic effort marked by fluid camera movement and dynamic angles. Though the film also features the same sets and much of the same costuming, George Robinson’s cinematography bathes them in an eerier, more shadow-drenched aesthetic. Dracula’s castle—one of the great horror sets ever constructed—is even more foreboding here, as is the ill-fated voyage west, which takes on a nightmarish tenor. Even smaller, less significant scenes, such as Dracula's initial meeting with Dr. Seward at the opera are more ominous, as the lights slowly dim around the characters in a moment that portends their doom. Reportedly, Melford and crew’s improved technical acumen owes to a bit of gamesmanship, as they had access to the English-language dailies and consistently set out to improve upon them. They also seemed to benefit from Universal’s more intense focus on Browning’s film, as it feels quite risqué for its day. Granted, the Hays Code was still a couple of years from full implementation, but the film feels highly sexual even for the pre-Code era. Villarias’s Count is more of an overt predator here, with his prey being fetishized more as sexual objects draped in more revealing clothing. Dracula is scary becomes his intrusion represents the most bone-chilling kind of violation, and this film has no qualms about highlighting the sexual overtones of his seduction (even changing the Mina character’s name to Eva conjures up thoughts of primal sinning, with Dracula serving as the serpent). Of course, it’s difficult to ignore just how much less effective Villarias is in the role. His Count is a little too toothy and broadly portrayed, and he isn't nearly as exotic or unusual as Lugosi, whose presence is rather bizarre and contradictory; he’s dapper and sinister all at once in a way Villarias never is. Ironically, he almost singlehandedly brings life to Browning’s film. It’s too bad Villarias isn’t as transcendent because the players surrounding him are every bit as good as their English-speaking counterparts, especially Tovar as Eva and Rubio as Renfield. If Lugosi is the MVP of Browning’s Dracula, then Dwight Frye is its unsung bench player, and Rubio admirably reaches similar heights in this production. Melford must have sensed as much, as a lot of the additional material here revolves around the ever manic Renfield. Some of the additional material isn’t as welcome, as the film does run into the same problems as its counterpart towards the end, where its stage origins are once again rather obvious. Long stretches of dialogue diffuse the urgency a bit, which is something Browning’s more direct approach avoids a bit more nimbly, though it can be hardly said that either version extols the virtue of showing rather than telling. Still, Melford captures some fantastic visual moments even amongst these more dialogue-driven scenes, with Dracula’s exit into the fog-drenched yard after his first encounter with Van Helsing (Eduardo Arozamena) being a skin-crawling highlight. The climax here is also moderately more effective since it’s not as hurried as Browning’s, though it still leaves a lot to the imagination and relies on some dubious logic. For many years, I’ve believed this would be the definitive version of Dracula if one could somehow splice Lugosi’s performance in, but such a line of reasoning underestimates Melford’s efforts here. This is a film that shouldn't be defined by an absence but rather by what it manages to do in spite of it. Though he had a prolific career in Hollywood, it must still be considered a bit of an upset that Melford's Dracula is so much more cinematically assured than Browning’s. This is not to dismiss the latter’s film by any means, as Browning’s effort in rightfully highlighting his star led to a portrayal of Dracula that is still definitive—it’s just that one truly has to wonder what could have been. 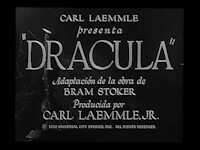 Browning’s film is legendary and revered with good reason, but this Drácula is not a mere footnote in the shadow of its more famous sister production, nor is it just a curiosity piece like so many alternate cuts: quite simply, it stands on its own rather well and bares some serious fangs when a comparison is inevitably made. Buy it!